At least 19 people have been confirmed dead and 50 more were injured after an explosion struck Manchester during an Ariana Grande concert. The incident was suspected by the police as a terrorist attack. 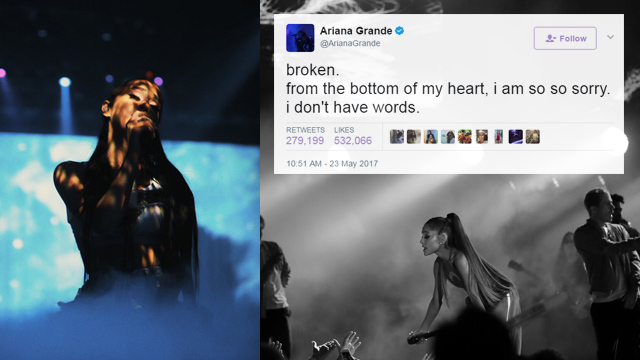 Thousands of fans were present during Grande’s The Dangerous Woman Tour when two loud bangs coming from near the arena’s bars were heard. The blast was reported to have hit the foyer of the building at about 10:30 pm. According to witnesses, everyone panicked to get out of the venue after the explosion. Paramedics and bomb squad arrived at the scene moments later. Victims were rushed to six hospitals across the Manchester area. Due to the incident, large areas around the arena have been sealed off. Victoria station has been shut down until throughout Tuesday. An estimated 21,000 people were reported to have been at the concert during the time of explosion. Most of the concert goers were minors. Another explosion in the Cathedral Gardens area took place, but it was a ‘controlled explosion’ carried out by the Greater Manchester Police. The item destroyed was not suspicious. Britain’s terrorist threat level has been at ‘severe’ in recent years with high possibilities of terror attacks. Meanwhile, Facebook switches on Safety Check facility for Manchester after the incident. Many worried parents and relatives flee to the scene to get their children who were only supposed to be enjoying the said concert. According to a representative from Grande’s US record label, the pop star is safe and they are also investigating what happened. The singer’s world tour began in February which will continue on at venues in Europe, Latin America and Asia.